After a 7 weeks of missing races due to bad weather and/or dealing with a strained neck, I FINALLY got to race my bike again AND semi-figured out what the heck is/was wrong with my neck. Oh happy day! I missed the mountain bike TT in Des Moines on Saturday but was able to get a last minute dr. appointment to figure out why neck was still throbbing after straining it weeks ago. Turns out my neck/shoulder muscle(s) thought it would be fun to get stuck in a spasm state and not release. An order for PT and prescription later and I was one happy lady- now I knew why I was hurting so badly and had a plan to make it better. And then I was so excited to get rid of the glaring pain in my neck/shoulder area that I didn't think twice about taking my new prescription before bed....the night before the State Crit...big mistake. I was feeling pretty sluggish warming up, but that is pretty much always the case so I didn't think anything of it. I snagged a starting spot on the front and was looking forward to a good race. I got a good position going into the first corner leading into the downhill. The group stayed together (including the 4's) and the pace was surprisingly laid back, especially considering the stacked field. I still wasn't feeling great on the uphills but kept with the group. A few laps in, as the group was rounding the (uphill) corner toward the start finish someone (I believe on of the 4's) tried to make a line where there wasn't one and a bunch of riders went down in a domino effect- including teammate Alijah who had a great chance at getting on the podium for our team. I somehow managed to get through the falling bikes and legs flailing in the air and didn't get caught up in it. 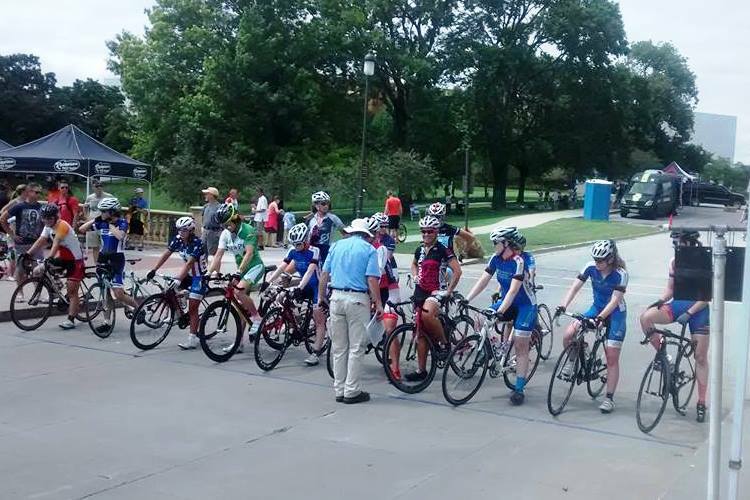 I hammed down a bit to catch back up with the about six girls that made it through the corner before the crash. With the group split, the lead pack took off, wanting to make sure a gap stuck. I struggled to stay with the group on the uphill and knew something was off. I just felt drained of energy. I wasn't able to respond to any increase in tempo. About three laps later I fell off the back with two other ladies. At about this time, girls from the crash were still being allowed to rejoin the lead group (free "lap", turned in to "laps" plural). I don't think anyone knew if they were still considered to be on the lead lap or were a lap or two down. With about 13 laps to go I really cracked and fell off the chase group and rode around by myself until getting picked up by riders coming from behind. I had no idea if they were on the same lap or behind, but I stayed with them for a bit and them fell off from them. It felt like I was going backward. I've never felt so awful and completely out of energy during a race. It was temping to pull out of the race but I made myself continue, knowing that if I wasn't already mad at myself for a crappy performance, I'd be even more pissed at myself for giving up. So I finished DFL. That race really hurt. Usually I've been able to push through it for the most part, maybe slightly lowering my pace, but never like this. To make my bruised ego feel a little better I chalked it up to taking a muscle relaxer the night before, but who knows. I'll make sure to review rule #5 before the next race.